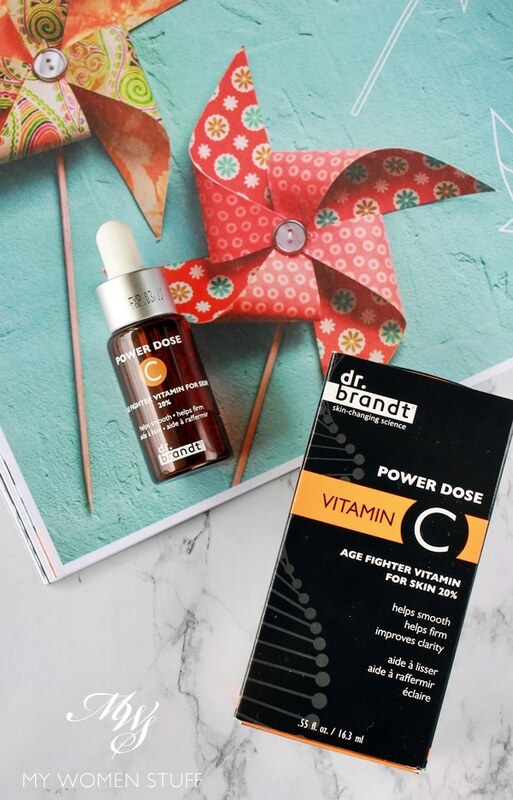 Home » New on shelves » The Dr. Brandt Power Dose Vitamin C might be small but it sure is mighty good stuff! The Dr. Brandt Power Dose Vitamin C contains 20% stablized vitamin c – 3-O-Ethyl Ascorbic Acid and Ascorbyl Methylsilanol Pectinate. The former, my research turned up, is what inhibits melanin production, and that is what offers the lightening of my dark spots and the inhibition of new ones. This beats any whitening serum I’ve used to date, because it not only lightened my dark spots (although that was not my primary intention to use it), but best of all, it did not dry out my skin! If you have hung around for a while, you’d notice that I do not feature whitening or brightening skincare products. I have pigmentation and dark spots, that are visible and I don’t do much about them. Having tried all sorts of these whitening skincare over the years, I have concluded that I am better off without them. Not only do they not do much in the long term for my skin, they dry out the skin something awful and ironically, the dehydration makes the dark spots darker. If you are using a whitening skincare range, don’t use it for the long term, and always use a hydrating serum because your skin will really go bonkers one day. But skin lightening was not what I noticed first. It happened fairly gradually, and only after a few weeks of using this once a day, in the morning. The first thing I noticed was that my skin was more even and clearer, that my pores looked smaller and my skin was firmer, fuller and smoother. The serum is a watery clear liquid that has a hint of yellow in the dropper. It is light in texture and absorbs quickly into the skin without any residue nor any oily feeling. After using this, when I went back to Hylamide C25 Booster, I noticed the oily feeling that many people had observed, but which I didn’t notice the first time around. The Dr. Brandt Power Dose Vitamin C doesn’t have this, feeling almost like water, with only the slightest of viscosity, and without any scent. The directions call for 3 drops, so I was quite faithful to it, using 3 drops each time, after toner and before a hydrating serum and moisturiser. You can also mix it with your moisturiser but I prefer using it on its own directly on skin. I also only used it in the morning, because Vitamin C is supposed to be an antioxidant that also helps to protect against UV damage. I could also use it in the evening, but I didn’t because I use other serums in the evening routine. If I had, I might have seen results more quickly and visibly. As for the skin lightening, how did notice this? By noticing that I was using less concealer and feeling much more comfortable using less, or sheerer foundations. My skin seemed to have a glow that I could not attribute to much else, because I’ve really been going through some really crappy times. There is a ways to go yet before my dark spots are gone. They might never be, but they are a touch lighter than what they used to be and I’m happy with this gradual fading as I don’t believe in products that promise drastic results. The size of this serum however, as I have noted, is tiny. Yet, because I use just 3 drops each time and I only use it once a day, it’s been over a month, almost 1.5 months, and I’m only about halfway through the bottle. I won’t pretend that this is by any stretch of the imagination affordable, because it isn’t. But it works so well, I will keep this on a to-repurchase list. I do plan to try others – you know me – which is why I can’t say with great certainty that I WILL repurchase, but because it’s easy to get hold of this one locally, I can forsee keeping it in my routine in the future. 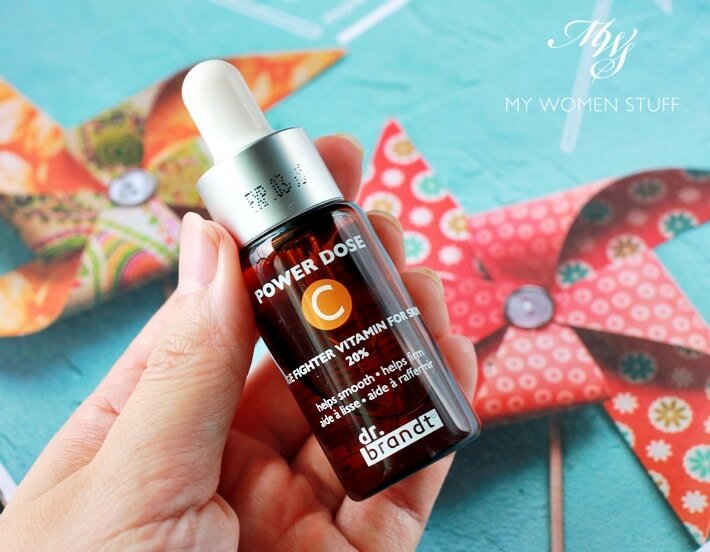 The Dr. Brandt Power Dose Vitamin C is a vitamin C serum that contains 20% of stablized vitamin C. It is a light textured serum that absorbs quickly into the skin without leaving any residue. With once a day use in the morning, I noticed that my skin was not only smoother and clearer, with a glow, but also that my dark spots were noticeably lightened, and I wasn’t getting any new dark spots. This had surprised me because I’d gotten so used to my pigmentation, that I didn’t think they’d get any lighter. Best of all, this isn’t drying at all. I do combine with a hydrating serum, but even when I don’t, it doesn’t dry my skin. I love it, even if I don’t love the price nor the little size. Does this serum interest you? 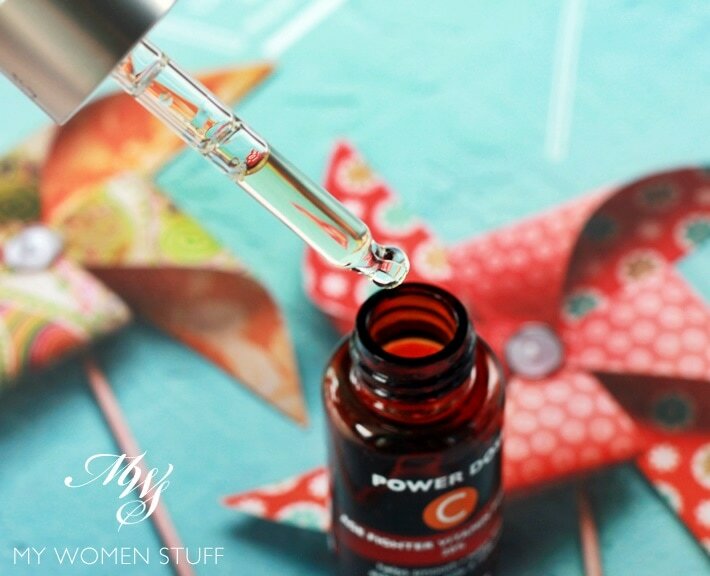 Do you use a Vitamin C serum? Readers may want to take note that, when applied on skin, vitamin c can cause allergy to some. I experienced itchiness, stinging sensation and redness, about half a day after the application and the symptoms lasted for about 3 days. The allergy wasn’t as severe during the 2nd and 3rd tries, it may meant my skin is adjusting to it, but I only dared it before the weekend. Wasn’t going for the lightening effect, though I have pigmentation too. Was just trying it out of curiosity. Thank you for the warning and reminder Luanne! It didn’t strike me about the skin sensitivity, because I didn’t react to it. Makes me forget that some people might! Sorry to hear that you had reacted to Vitamin C, but it’s good to know that it’s slowly adjusting. I suppose like all effective ingredients, like retinol for instance, a period of adjustment for the skin is necessary before we go all mad scientist and whack everything on 😀 Is your skin more receptive to Vit C now? Ah..but its so expensive :-(. I am loving the Hylamide C25 Booster which I started using at the end of May every morning and which still has maybe 30%-40% more to finish. Like you said, Vitamin C does help with skin clarity and it gives a nice glow to the face which I only noticed after comments by friends and colleagues. Would love to try this but its over my budget. Unfollowing as your posts are basically advertisements, therefore, can not be truthful, even if you state otherwise, because frankly, what else would you say. It’s odd people would have that opinion (especially if they are subscribers) because not all your reviews are positive… people are so odd aren’t they?! How did I miss this post? I just used up my Deciem Vitamin C and was going to repurchase. You convinced me with this, but it’s not available at Strawberrynet at the moment! Aah! I’m also curious how The Ordinary compares. Have you tried? You can get it off http://www.kensapothecary.com.my! 😉 I’m just almost done with this one, and while I have The Ordinary vitamin c on standby, I am planning to repurchase this one because it’s so good! 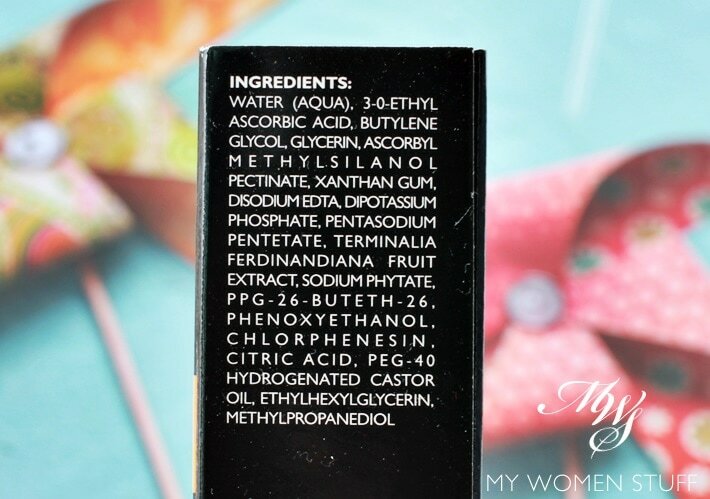 I am using Wishtrend’s Pure Vitamin C Serum 21.5. So far so good! I feel like it’s helping to reduce marks left from acne. I read that we are supposed to use Vitamin C as the first step because of its low pH levels and leave it for at least half an hour before applying the next step. Do you do that? I normally don’t have time in the morning so I don’t wait half an hour (more like 30 seconds). Hi. I was trawling for a review on Vitamin C serum and found your post. Thanks for a great review. Would you mind sharing what moisturizer and toner you use together with this serum? Many thanks! By the way, is the serum supposed to smell a bit sourish when sniffed up close? I recently left it accidentally in my car’s trunk ( inside my luggage) where it might have been exposed to some heat. Being the paranoid girl I am I googled for signs that ur vit c serum has gone bad. some says ur serum is supposed to be odourless. I never sniffed it up close before so im not very sure. The colour has not changed though. Any thoughts on this?